"This is the most hilariously funny and deadly serious mystery debut since Janet Evanovich's One for the Money." "Parks' writing is graceful and often gripping, and he creates a handful of vivid characters, both journalists and their sources. His portraits of the city and its drug trade, the newspaper, and Carter's journalistic techniques all sound knowing... This could develop into a solid series." "This terrific page-turning debut features a likable protagonist, engaging supporting characters and some witty and amusing dialogue. Readers will want to see where this compelling tale takes them." "Parks's entertaining debut introduces an appealing hero, 31-year-old investigative reporter Carter Ross of the Newark (N.J.) Eagle-Examiner... Colorful supporting characters plus Ross's grit and determination keep the story moving at a good clip." "A first-rate crime thriller. 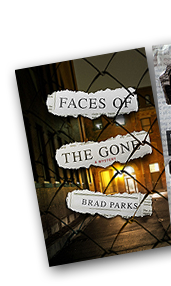 . . Faces of the Gone is gritty and hard boiled, but with a sly sense of humor. This strong and confident debut is sure to make an appearance on many "best of" and awards lists. Parks is a bright new talent whom readers will hopefully be able to enjoy for years to come." "A well-paced whodunit... Faces of the Gone works well on several different levels. Whether your interest is a well-crafted mystery with a surprising twist or two, the newspaper industry or New Jersey geography, you're almost certain to find some things you like in it. Perhaps more than few." "Impressive debut... Carter's fresh voice, his willingness to be entertained balanced by honest sympathy and some sharp editorializing, is the book's considerable strength. The action, including a string of bombings, is brisk; the villain's identity is elusive; and the settings (from the projects to National Drug Bureau offices) ring true. How could this be better?" "The novel reads like a bit of investigative journalism: told in reporter's prose, with dollops of humor, suspense, and violence. Like his creator, Ross is aware of the pain in the things he writes about. He's also aware that makes for darned good reporting." "A capable follow-up to this author's award-winning debut mystery... Mr. Parks, himself a former newspaperman, knows this turf well. In the course of showing Ross nailing down the story, he has a lot of fun with office politics, Ross's love life, and the desire that a put-upon reporter may sometimes feel to have a conversation with a sympathetic Coke machine." "Fast-paced, thoroughly satisfying... Carter Ross is not only a first-rate investigative reporter; he's also a first-rate comic. It's a rare mystery that provides a good laugh on almost every page. One can only hope that Brad Parks has more mysteries for Carter Ross to solve in future books." "With Ross' keen editorial observations, his self-deprecating humor and his supporting cast of characters, "Eyes" is a welcome addition to my shelves of newspaper noir." "An engaging and exciting crime novel series... Brad Parks is another wonderful modern New Jersey noir novelist to go on the shelf next to Harlan Coben." "Darkly humorous... Parks hits home with this installment of quirky characters, convincing color, and a Sopranos-worthy ragout of high drama and low comedy." "Award-winning Parks's third Carter Ross mystery has all the elements for a fun escape read—to New Jersey. His chatty style, quick pace, and trademark team efforts make this series a refreshing tonic for the mystery soul." 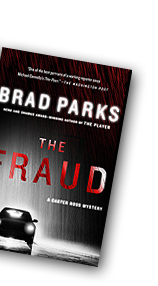 "Brad Parks has crafted another complex and satisfying mystery, full of suspense and newsroom intrigue." "A tantalizing tale that...[combines] grit and wit. Parks not only intrigues the reader with his plot but also impeccably depicts newsrooms and their denizens." "If I were buying a beer for Carter Ross, the irreverent 'unrepentant newspaperman' for the struggling Newark Eagle-Examiner, it would be a local brew served in a bottle and not something foreign served in a glass. He's that kind of guy, and I'm happy he's back in Brad Parks' The Girl Next Door"
"Through his portrayal of newsroom culture and the ailing (if once-mighty) American independent paper, Parks ascends the more pulpy shallows of the genre. The Girl Next Door is perfect for the reader who loves an LOL moment but wants a mystery that's more than empty calories." "Readers old and new will enjoy Good Cop... Parks' laid-back narration and appealing protagonist add up to a great lighthearted read. Though it's the fourth Carter Ross book, newcomers won't feel lost." "Parks nails the newspaper milieu and the Newark setting, while his solid cast of characters should keep readers eagerly awaiting the next installment." "The combination of Borscht-Belt dialogue, ebullient first-person narration, and mean Jersey streets with lots of menace... makes Carter a strong contender for the title of best Stephanie Plum male impersonator." "While many authors are adept at balancing suspense with humor, few rival Parks, who will leave you breathless one minute and laughing out loud the next. This is an admirable feat unto itself, and, coupled with a protagonist as likable (and occasionally incorrigible) as Carter Ross and the series' authentic backdrop, it makes for a most pleasant and informed reading experience. It's been said that easy reading makes for damn hard writing, and if The Good Cop is any indication as to the truth of that statement, Brad Parks is an overachiever." "Compulsively readable. . . Ink-stained heroes are a dying breed. Enjoy this one while you can." "Parks smoothly blends grit and wit." "While he spins a serious yarn, he injects enough humor that generates grins. But remember: Grins expose teeth, and The Player delivers a bone-crunching bite." "More deeply felt than Carter's first five cases: reliable entertainment that'll make you think twice about your next trip to Newark." "Parks' sixth Carter Ross story (has) a more serious, reflective tone than previous entries, noted for their comedic appeal. Series fans should rest assured, however, that Carter's witty turns of phrase are still in evidence, and his undeterrable investigating is as engaging as ever." "The sixth in Brad Parks' award-winning series is as entertaining as its predecessors, and the congenial, self-deprecating Ross gives readers a laugh on every page." "The Carter Ross series (has) all the excitement and drama of a Hollywood action flick... A terrifically entertaining page-turner."